Many dog breeds have been painstakingly bred to enhance useful characteristics such as tracking, guarding, hunting and herding. The development of the toy dog breeds, however, has produced tiny companions for pure enjoyment. These little canines make wonderful pets. They are ideal as apartment dogs, which is why they tend to be so popular in city environments. They are easily portable, which makes them good travelers. They are often perfect for elderly owners due to their small size and small feeding demands. Examples of these breeds include Chihuahuas, Yorkshire Terriers, Toy Poodles, and Pomeranians, as well as the newer, papered mixed breeds, such as the Yorkie Poo and Maltipoo. 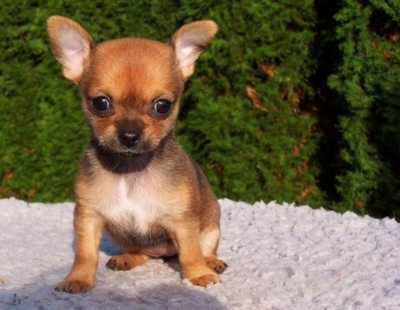 All of these dogs are tiny as adults….as puppies, they are diminutive, especially as newborns. Because of their super-small size, these puppies have problems with blood sugar regulation that can surface during their first several months of life. What is Toy Breed Hypoglycemia? Glucose is the main source of energy for the body and the only source of energy for the brain. When most of the glucose in the blood is used up (hypoglycemia), the body responds by releasing stored glucose from the liver. As the amount of glucose supplied by the blood drops, the brain is one of the first organs affected. When no more stored glucose is available for energy, the brain can be damaged beyond repair. Toy breed hypoglycemia is seen in toy breed dogs less than 5 months of age. Toy breeds are particularly vulnerable because these little guys have more brain mass per body weight compared to other breeds. They need more glucose for their size to maintain proper brain function. There are several reasons that blood sugar issues arise in toy breed dogs. 1. Their tiny size makes it difficult for them to regulate their body temperature. 2. They cut their teeth late, and thus can have difficulty chewing hard kibble – even puppy sized kibble. 3. The previous two points combined can result in reduced food intake. This makes it difficult for the body to regulate blood sugar levels. 4. They become listless as they get cold and then they don’t even have the energy to eat. 5. When blood sugar drops it creates more listlessness. The brain needs glucose for energy. Without it, incoordination results and in advanced cases, seizures may occur. These tiny puppies may need to be fed four to six times daily. Check the food bowls to be sure the puppy is eating often and well. They may need to have their kibble softened with water or broth, or offered soft/canned food that they can manage without teeth. Be sure the puppy likes the food. This is not a time to be offended by a picky eater! Veterinarians often supply caloric supplements/foods that can be used to boost the blood sugar enough to prompt a puppy to eat its regular food. Nutrical and Hill’s A/D are two examples. These products are intended to be extremely palatable and tempting. Some puppies, even when listless, will readily lick them from a finger. Others may need it to be smeared directly on the roof of their mouth. This is often just what a little one needs to get it jump started and thinking about food. If you’re packing a tiny canine, it’s a handy substance to have around. Toy breed puppies need to be kept warm even on days that don’t necessarily seem cold. How lucky that toy breed fashions are so popular! Itty bitty sweaters and sweatshirts are just the ticket. Keep extra blankets in the places that they like to curl up, so they can nest and burrow. If the puppy is showing signs, refusing to eat and not responding to tempting foods, the first thing to do is to grab a bottle of Karo Syrup (corn syrup). Immediately rub a small amount directly on the puppy’s gums. Because the gum tissue will absorb the sugar directly, the puppy does not need to swallow. Following this, wrap the puppy in a warm blanket and head to the veterinarian. At the vet clinic, the puppy will be warmed, blood sugar will be checked, and if necessary, an IV drip will be started with Dextrose (sugar) infused directly into the bloodstream. Response is usually rapid if the hypoglycemia is caught in time. The veterinarian will not release the puppy until it reliably eats on its own. At home, several days of extra care may be needed. It is extra important to watch food intake and be aware of any changes in energy level. If a bacterial infection is present in the body in some form, blood sugar can be diverted from providing fuel for the body to providing fuel for bacteria. When puppies present with recurring hypoglycemia, they are sometimes given antibiotics to cover this possibility. Stress is always rough on puppies. When stressors are present, maintaining a healthy blood sugar level is all the more difficult. Any type of stress increases the body’s demand for blood sugar, whether the stress is caused by their surroundings or bodily stress – such as parasitism or diarrhea. This is why toy breed puppies (and all puppies!) need to be kept current on parasite control. Parasite, including fleas, are not life-threatening in small numbers, but these puppies are so small they can’t afford to lose any of their blood. Deworming is also very important. Sometimes the liver does not develop properly and therefore cannot function normally. Usually, blood carries nutrients digested from food from the digestive tract to the rest of the body by way of the liver. One of the main functions of the liver is to regulate blood sugar levels. If the liver has not developed correctly, blood sugar regulation can be compromised. A portosystemic liver shunt is a blood vessel that carries blood around the liver instead of through it. Because the blood bypasses the liver in dogs with shunts, the liver cannot do its job. Toxins may build up in the bloodstream or kidneys, blood sugar levels are compromised, and the animal lacks the necessary materials to give it a ready source of energy and to help it grow. Portosystemic liver shunts are a problem for the Yorkshire Terrier in particular. By some accounts, the Yorkie has almost a 36 times greater risk of developing shunts than all other breeds combined! Shunts can often be corrected with surgery. You can see from all of the above, that having good veterinary care is an important part of raising a toy breed puppy. Time is of the essence – if your puppy is coughing, having diarrhea or vomiting, shows little interest in food, or seems listless...get to the vet! As the puppy ages, they gain in size and weight, their teeth grow in and become strong, they gain fat stores, and their immune system matures and begins to function efficiently. Hypoglycemia risks then become minimal. With a little extra care, a toy breed puppy will soon be out of the woods…and into the trouble that all healthy, happy puppies seem to get into!